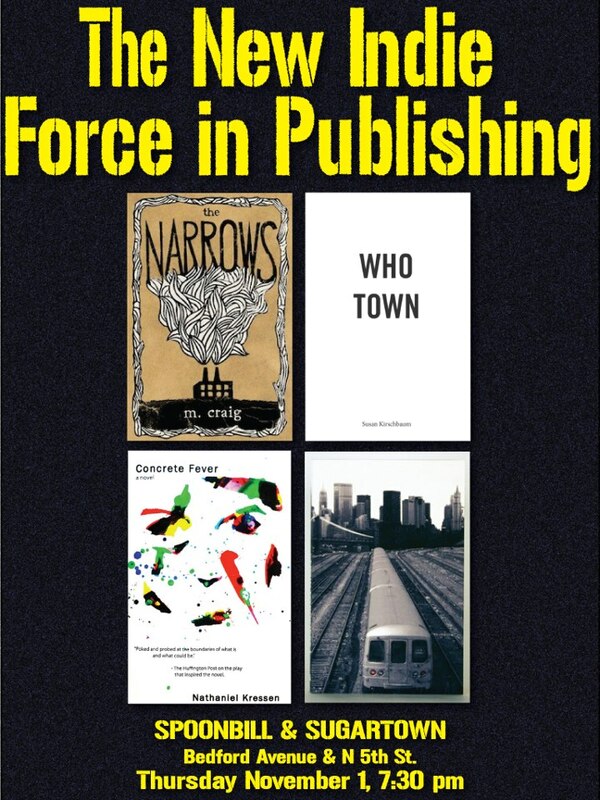 Don't miss this panel discussion on indie publishing to be held Thursday, November 1, 2012 at 7.30 PM at Spoonbill & Sugartown in Brooklyn. To initiate an ongoing debate on the state of independent publishing, Spoonbill & Sugartown Booksellers is bringing together local indie authors who have chosen to forgoe traditional publishing and forge their own paths to authorship. Through consistantly selling out at indie bookstores around the nation and garnering accliam for their work, these wordsmiths are proving to be the vanguard of a new model for publishing. The night features m. craig (The Narrows), Susan Kirschbaum (Who Town), Nathaniel Kressen (Concrete Fever), and Rami Shamir (Train to Pokipse) -- who will talk about the struggles and joys of independent publishing. Specific issues of finance, book-production, editing, and promotion will also be addressed. The authors will share the various approaches they've taken in dealing with these issues, while being questioned by the evening's moderator and Spoonbill's book buyer, Jamie Johnston. The event will take place on Nov 01, 2012 at 7.30 PM at Spoonbill & Sugartown in Williamsburg. Post script: There is a chance that Anonymous. author of The Oxygen Thief, will also participate in the panel. This event has been POSTPONED due to Hurricane Sandy. As of now, there is no new date. Stay tuned to Spoonbill & Sugartown's events page to find out about the new date.